in One Pot Meal ideas, regional recipes, Rice, Rice/Pulao, Streetfood, Veg. 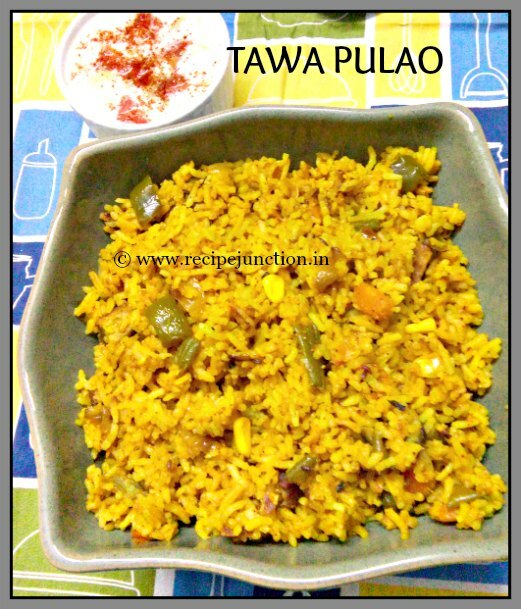 Tawa Pulao or popularly known as Mumbai tawa pulao is a popular street food of Mumbai. As the name suggests, the rice is made on a huge flat tawa where the street vendors prepare the famous Pav bhaji, another popular street food of Mumbai, a vegetable mishmash. The rice is flavoured with pav bhaji masala and it's mostly made adding some vegetables. If you have leftover rice, make use of that rice, just add few blanched or shallow fried vegetables and keep handy, a pack of Pav bhaji masala and you can make a flavourful, spicy but healthy rice dish in a jiffy. This rice is good to pack in lunch-boxes or for a quick lunch or dinner. Lemon juice : 1/2-1 tsp. If you are making fresh rice, then cook the rice till they are just done, not overcooked. Drain the water in colander and keep aside the rice. Boil the potatoes separately till they are just done. Cut carrot, green beans and capsicum in small cube like pieces. Heat oil in the pan, temper with cumin seeds, then add chopped onions, add the carrot and green beans and cook covered in medium flame till they are half-cooked. Then add capsicum, green peas and corn kernels, again cook covered till all the vegetables are cooked through. Add boiled potatoes, tomatoes and ginger-garlic paste in the pan and cook uncovered till tomatoes are soft and raw smell of ginger-garlic goes away. Add chopped green chillies and all the powdered spices like turmeric, red chilli and pav bhaji masala one after another. Mix the spices thoroughly with the vegetables. Now it's time to add the rice little by little. Add salt as required and give it a good stir in high flame. Cook for 3-4 minutes in medium-high flame, lastly add lemon juice and mix well. Sprinkle fresh coriander leaves over the cooked rice and give a quick stir and remove from heat. 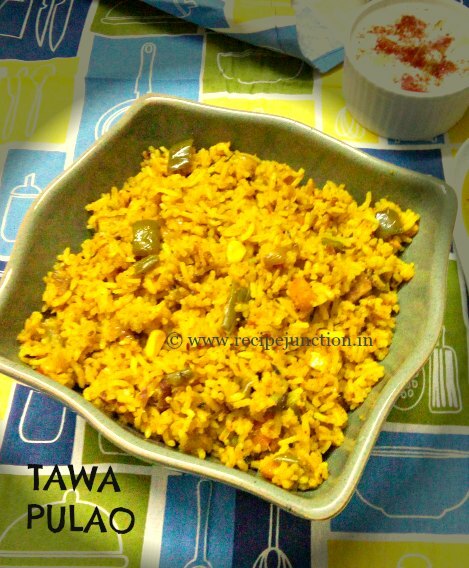 Your flavorful and spicy Tawa Pulao is ready to serve. Labels: One Pot Meal ideas, regional recipes, Rice, Rice/Pulao, Streetfood, Veg.